Bike the Drive- One of the Best Ways to Cross Train! I am on the injured reserve list. The injured reserve list or IR list is an official designation used by the National Football League (NFL) and National Hockey League (NHL) for athletes who become injured and are temporarily unable to play. Well I am an injured runner and can’t run, so I extrapolate this to my running sport. I have had a host of injuries during my five years of distant running. The worse being a meniscus tear in my right knee. Well now I have a nagging injury that has been going on since June 2014. I have mentioned my foot injury in few of my past blogs. My nagging injury is plantar fasciitis. The plantar fascia is the thick tissue on the bottom of the foot. It connects the heel bone to the toes and creates the arch of the foot. When this tissue becomes swollen or inflamed, it is called plantar fasciitis. Well despite my nagging injury, I continued to run. I did take a month off after my marathon in October 2014 that was a first for me. I then started training for the Pro Football Hall of Fame Marathon. My training started off quite well, I had no foot pain, but in February 2015, it returned. 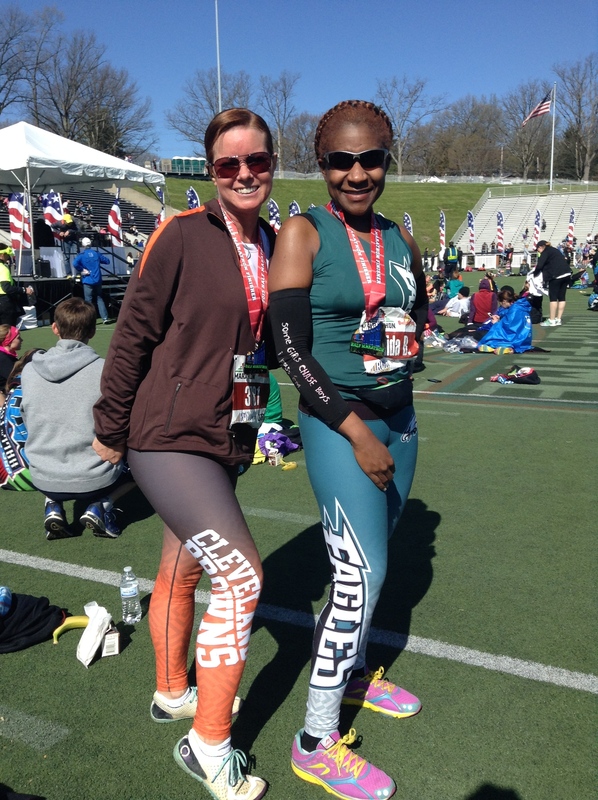 I downgraded the Pro Football Hall of Fame marathon to a half marathon, as mentioned in my last blog post. I ran Ragnar Relay two weeks, prior to the half marathon. 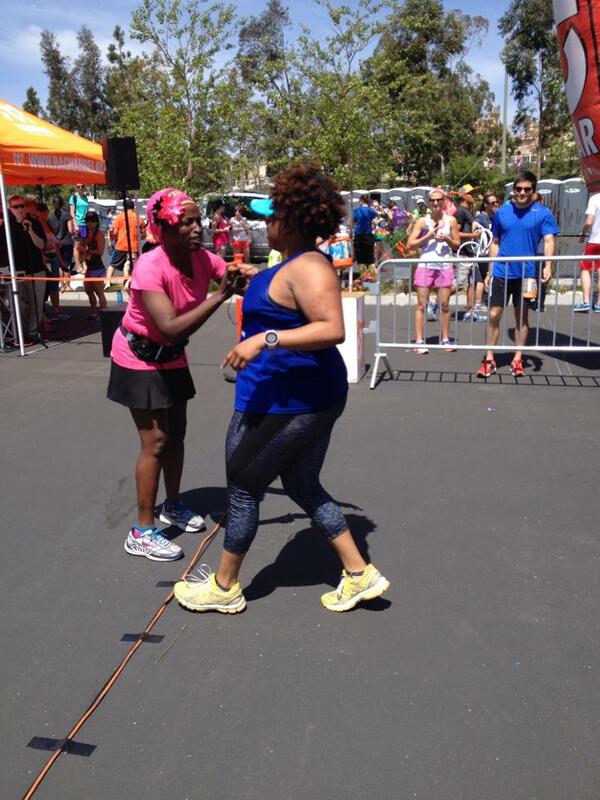 I then ran Susan G. Komen 10k race two weeks following the half marathon. I had to run that race. It has been an annual tradition for me since my mother’s diagnosis, and eventually passing away from breast cancer. After the race my foot hurt so much, I could barely walk. 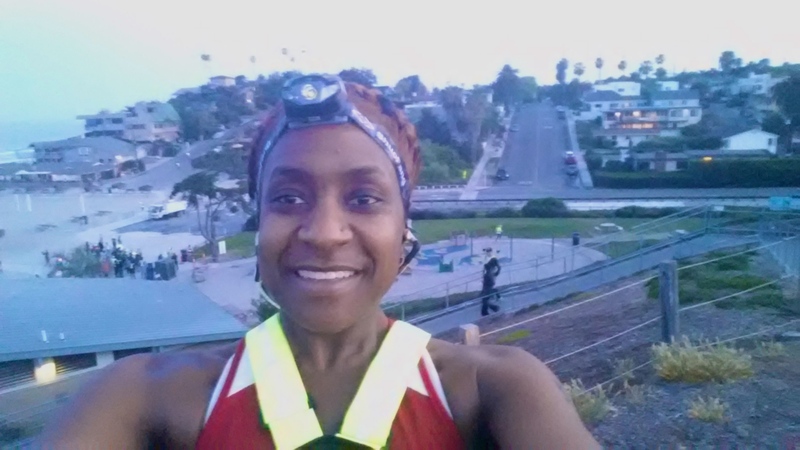 When my pain initial stared in June 2014, I only had pain in morning and after long runs. Long runs were runs more than eight or so miles. I am a doctor, and I often treat myself, which has its pros and cons. I put myself in a walking boot for a little over a week to take pressure off my foot. I also wrote myself a prescription for physical therapy. I stopped running. I have missed few races in the process. To cross train I have been biking up to 5 to 6 times a week. Mainly spinning, but the weather has finally warmed up, so I have taken my bike out a few times. 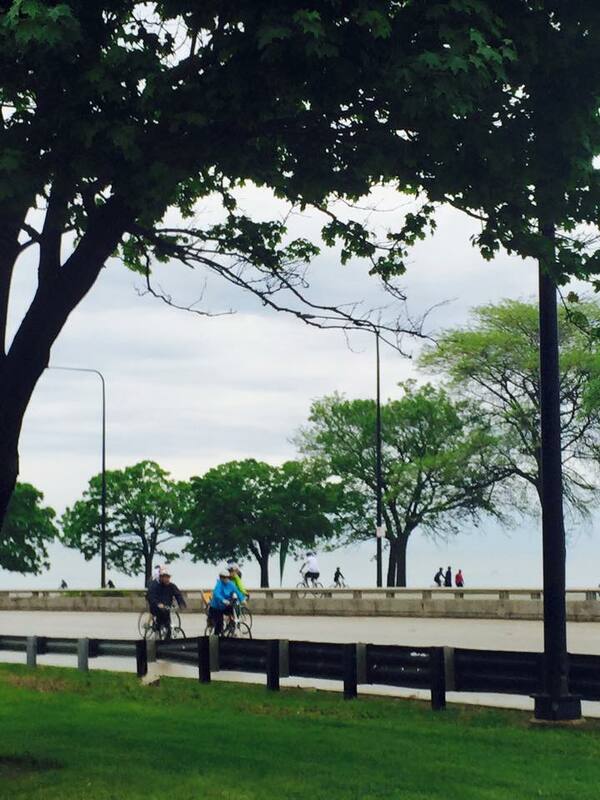 Every year during Memorial Day in Chicago, Lake Shore Drive is shut down for six hours for Bike to Drive. It is an awesome experience to ride on the road, no cars, just bikes. The ride is thirty miles. I ride with a group of friends. 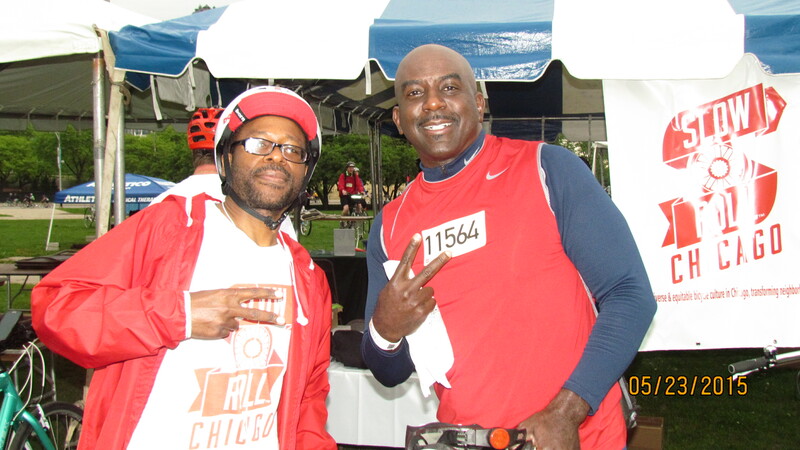 I had to miss Solider Field 10 miler race, which takes place the same weekend due to my injury, but biking does not bother my foot. 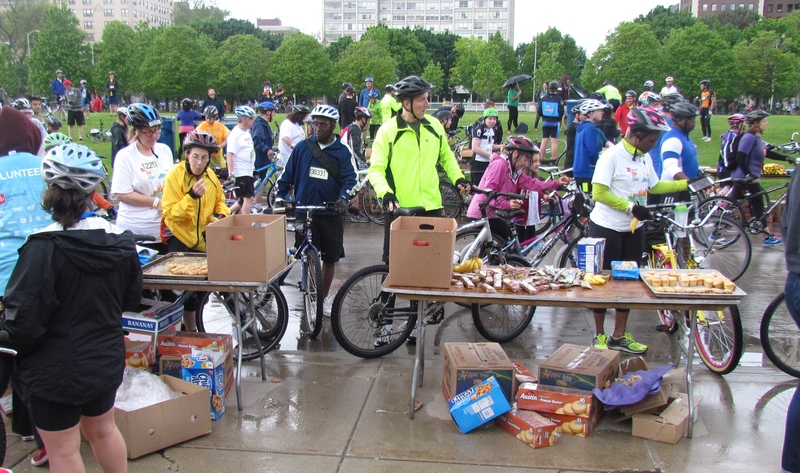 Bike to Drive started in Grant Park. 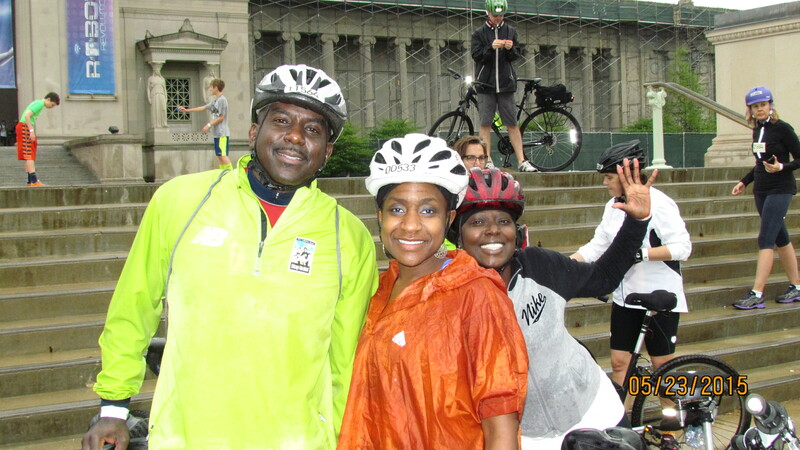 I did the ride with two groups- Slow Chicago, and Outdoor Afro. 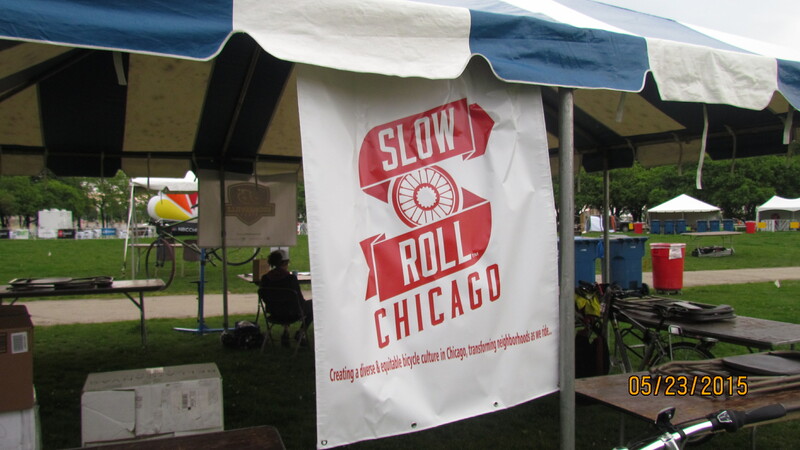 Slow Roll is a global movement founded in 2010. 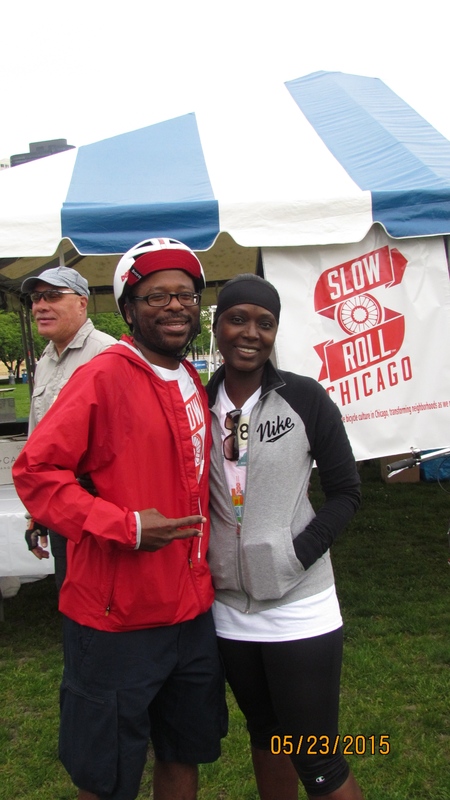 Slow Roll Chicago is a community-based organization utilizing bicycles to connect a diverse group of people, transform lives, and improve the condition of communities by organizing community bicycle rides and other bicycling-related programs throughout the greater Chicago area. 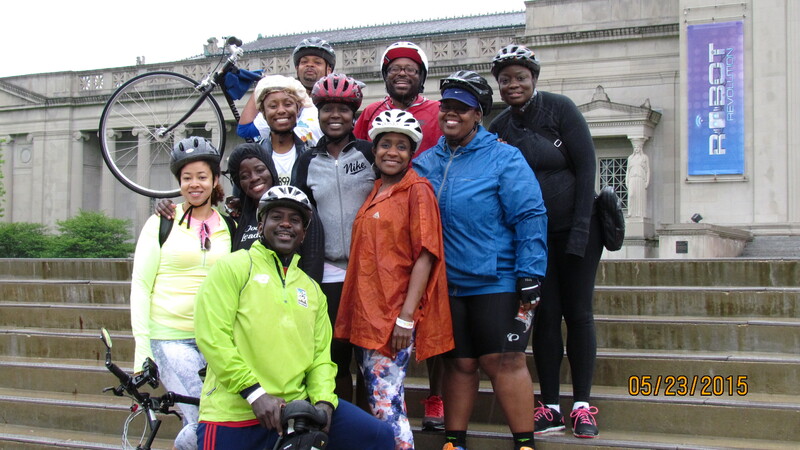 Outdoor Afro is a social community that reconnects African-Americans with natural spaces and one another through recreational activities such as camping, hiking, biking, birding, fishing, gardening, skiing — and more. We started at Grant Park. 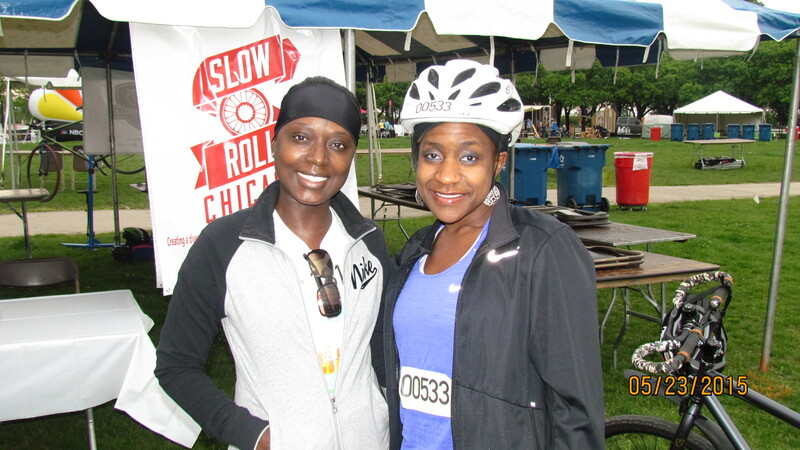 We met at the Slow Roll Tent. We then rode south to the Museum of Science and Industry. We had a check point there. At the checkpoint there were mechanics for those who have problems with their bike as one of my friends did. They also have food and water. It was a great day despite the rain. I was prepared for the rain with my poncho. The rain did keep few people home. The Museum was also a turn around point. Our group would then head north. We lost one of our group members due to bike trouble. We head back north towards Grant Park. There was another checkpoint, but we decided to continue. The north part of the trail was very hilly. There are small rolling hills. This year the hills were easier than last year. I had only bought my bike a week before the event so I was not in the best biking shape. We traveled to Hollywood section of North Chicago. There was another checkpoint. We stopped and then headed back to Grant Park. We were on our last leg. 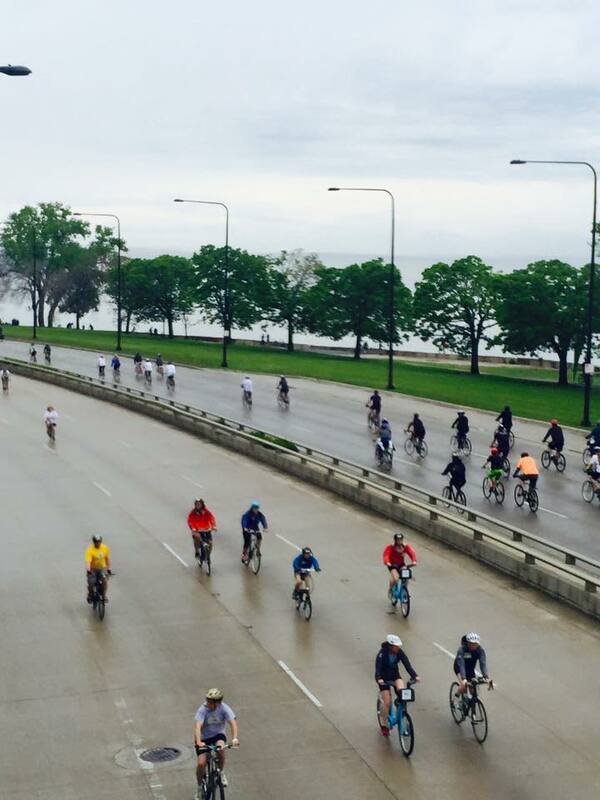 We picked up the pace to make it back, before they opened up Lake Shore Drive. 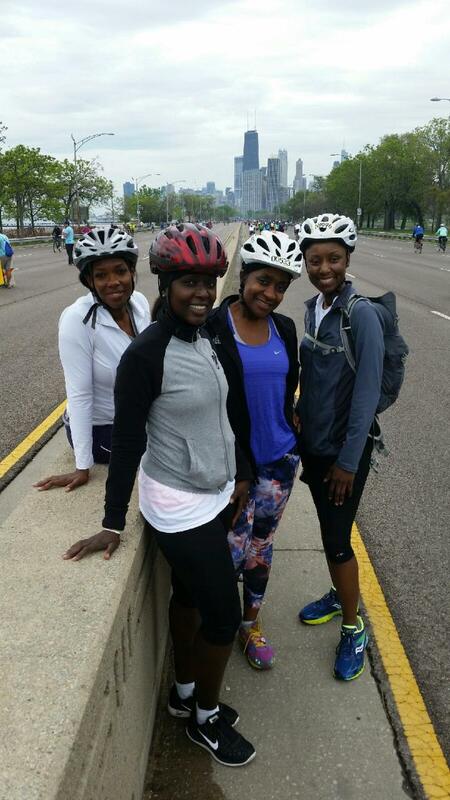 The very last part of the route was a steep hill by Navy Pier. Often people get off their bike and walk up it. My heart rate was up, and I was pumping. I got a little of the rush that I get when I am running. I love a challenge and that was the most challenging part of the day. We did it, 30 mile bike ride. My quadriceps were feeling it, but I was happy. I could not run, but I still could work out. It was so much better with friends. The reason I actually love running races is the people, the crowds, and the supporters who cheer. Bike to Drive gave me a little of that so I was happy. Everyone who really knows me knows that I love running, and I love football. I was searching for a spring marathon for 2014. 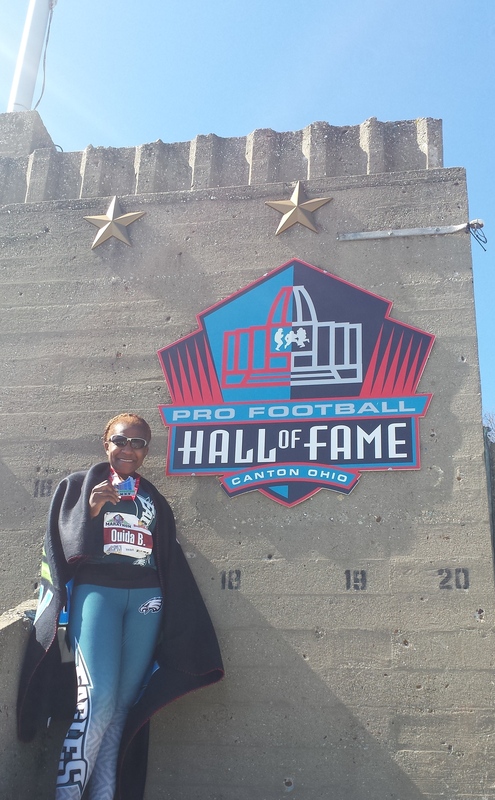 As I was searching the internet I came across the Pro Football Hall of Fame Marathon in Canton Ohio. The medal was shaped like a football. I thought perfect race for me. I sent the picture to my friend CG. He laughed, he loved the medal. CG knew it was the race for me. Unfortunately I did not make the race in 2014. My Dad was admitted to the hospital in early April. He was actually dying of cancer. I took several trips back and forth to Mississippi to see him, so my training suffered. I would have stayed the whole month, but I had to work. 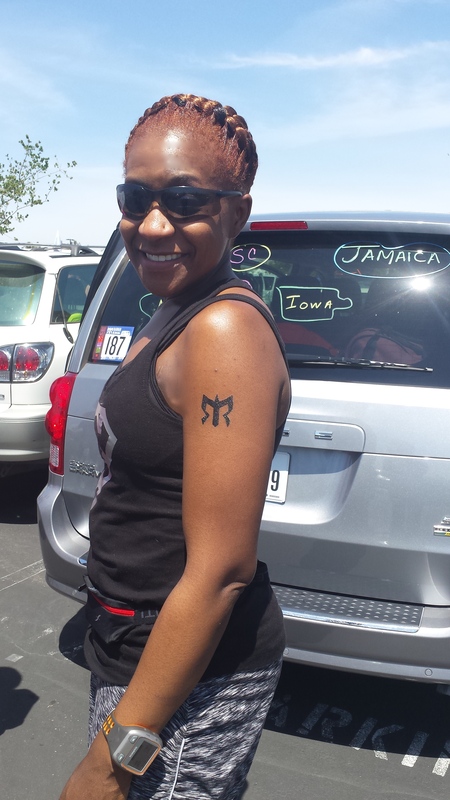 I decided to defer the race, due to lack of training and I wanted to go back to Mississippi the weekend of the race. I was worried, I had this bad feeling. I am so glad I did, my Dad ended up passing away on Sunday 4/27/2014 the day of the race. 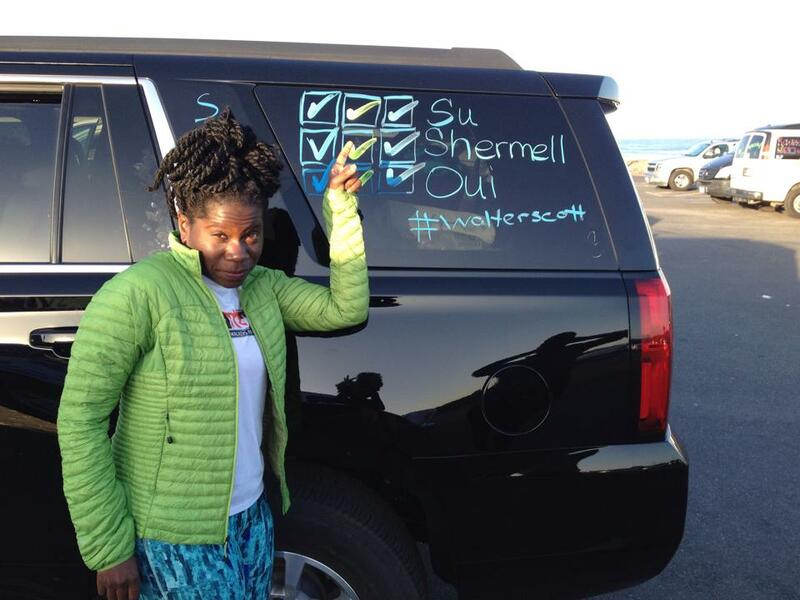 The race organizers let me defer to 2015 so the plan was to do the Marathon, but my body was not having it. I had plantar fasciitis ( condition in which the fascia – connective tissue on the bottom of my foot is inflamed) and the whole month of February I was sick with the flu, and several colds. So my training again suffered. I decided to downgrade to the half. I figured my foot could handle that. I have learned the hard way to listen to my body. 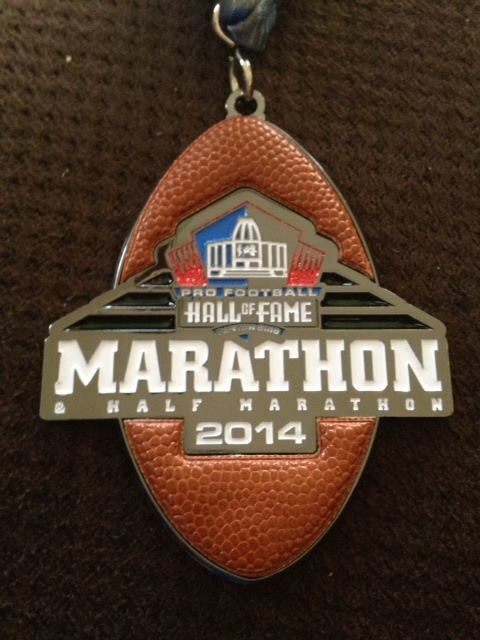 So April 2015 I would do the Pro Football Hall of Fame Half Marathon. The whole weekend was bitter sweet, due losing my father a year to the date of the race. 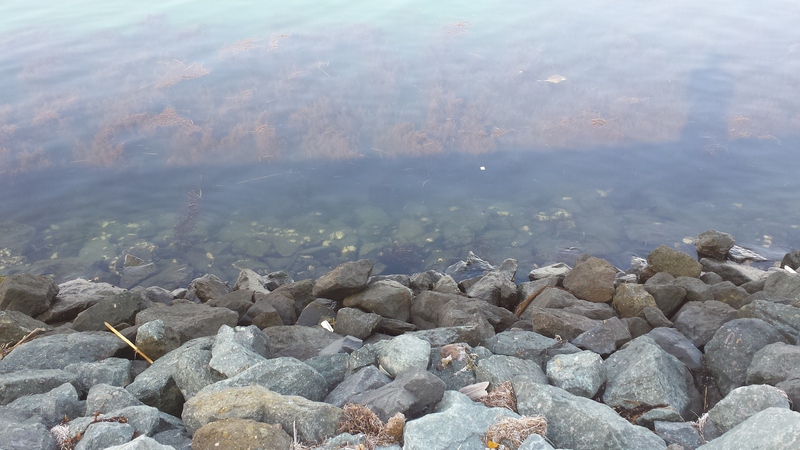 I decided to run and think happy thoughts of him. My father loved football. He was a Pittsburgh Steeler fan. He was the one who first introduced me to the game. I remember my grandfather being a Dallas Cowboy fan, and my Dad being a Steeler fan. On Sunday they would have words. It used to amuse me. I flew into Akron-Canton airport. It is very small airport. My hotel shuttle then picked me up. McKinney Grand Hotel was where I had made a reservation. The host hotel was full when I made my reservation. I was not pleased with McKinney Grand. The people were very nice, but the hotel was old and not the cleanest. It did not meet my standards. It also was farther away from race and expo than the host hotel. One of my running friends that I hat met at a race RT had a double and was willing to let me stay with her and another running friend. So the hotel let me check out Saturday although my reservation was until Monday. I initially did not want to rent a car. I figured I would use Uber, which was not the smartest move. Uber was new to city, and they did not have that many drivers so it took up to fifteen minutes to get picked up. I also seemed like their prices were higher than what I was used to in Chicago. So I got a car on Priceline for the remainder of my stay. I would recommend a car to anyone who is going to Canton. The Race expo was fun. 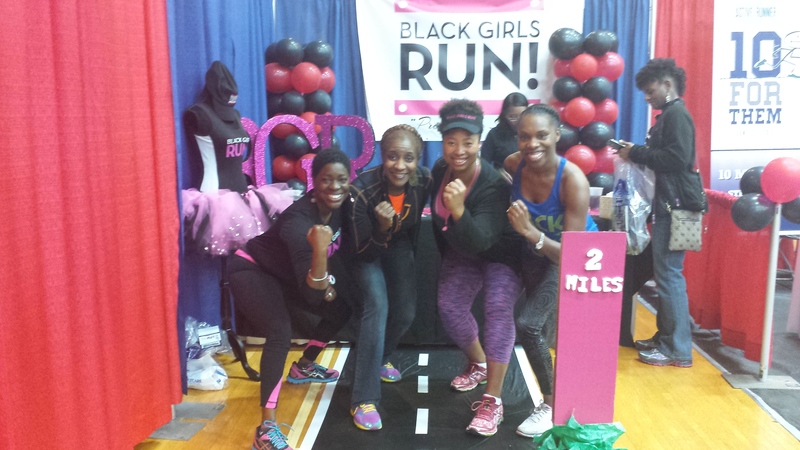 I met so many people from Black Girls Run Cleveland. They had a booth at the expo. It was nice to see some friendly faces who could give me some information about Canton. 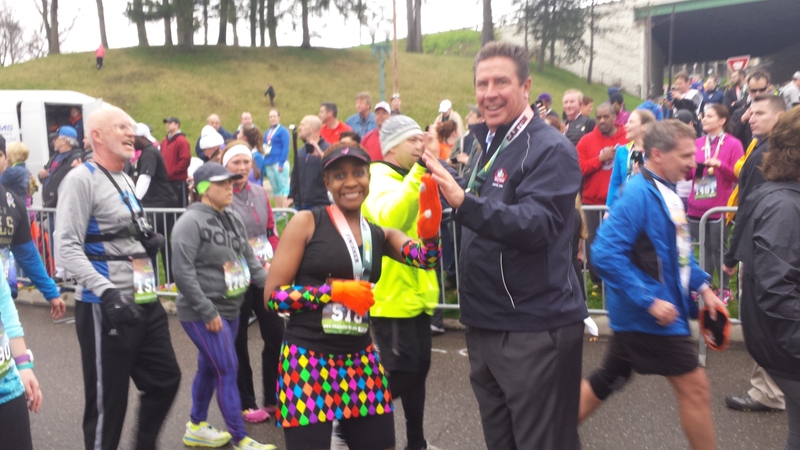 I had traveled solo to the race, so it was nice to make some new friends. I picked up my race bibs for 5k and half marathon. I also bought a key chain, which was a replica of 2014 race. I loved it, it was shaped like a football as indicated above. Saturday I woke up and felt so tired. 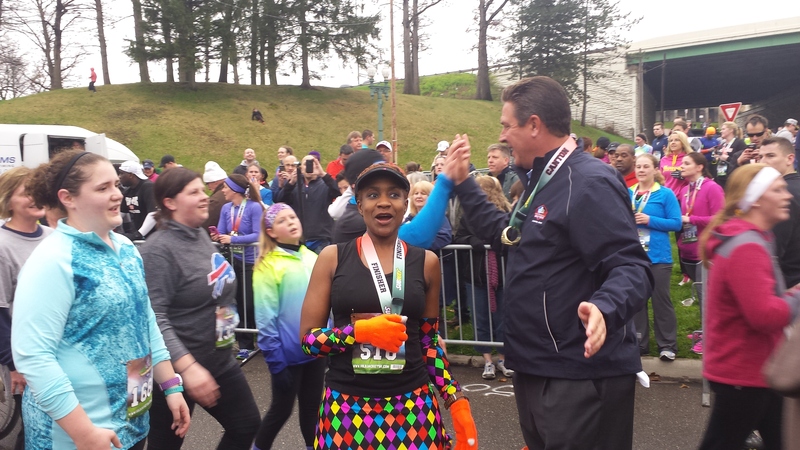 I wanted to stay in bed and skip the 5k, and just do the half marathon. I forced myself to make it. I thought it would be fun. I arrived at stadium. 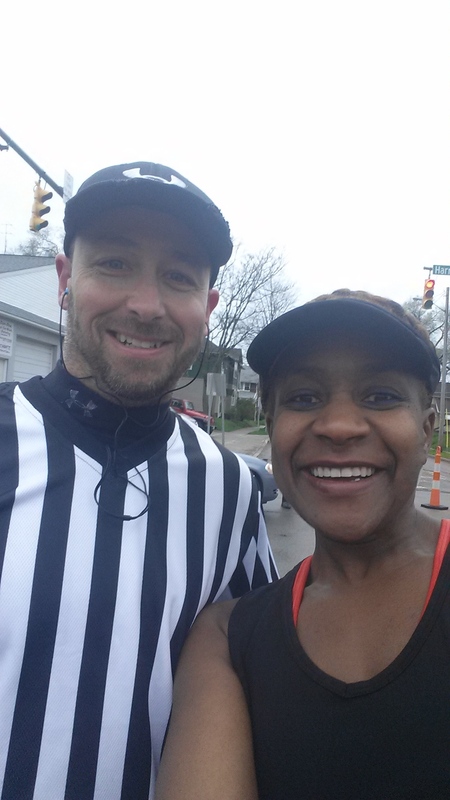 I met a member of BGR Cleveland who was about to run her very first 5k. I was so excited for her. We actually ran part of the race together. I run into one of my college classmates who I had not seen since college. I met his friends and family. 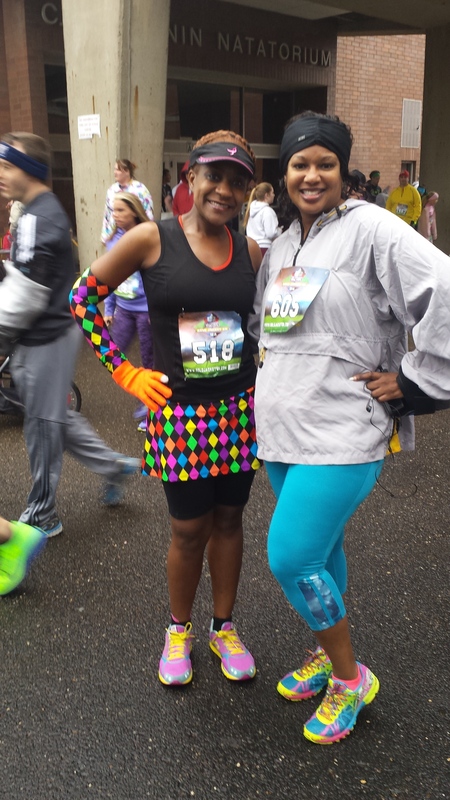 I also saw one of my friends that I had met at another race from Detroit. 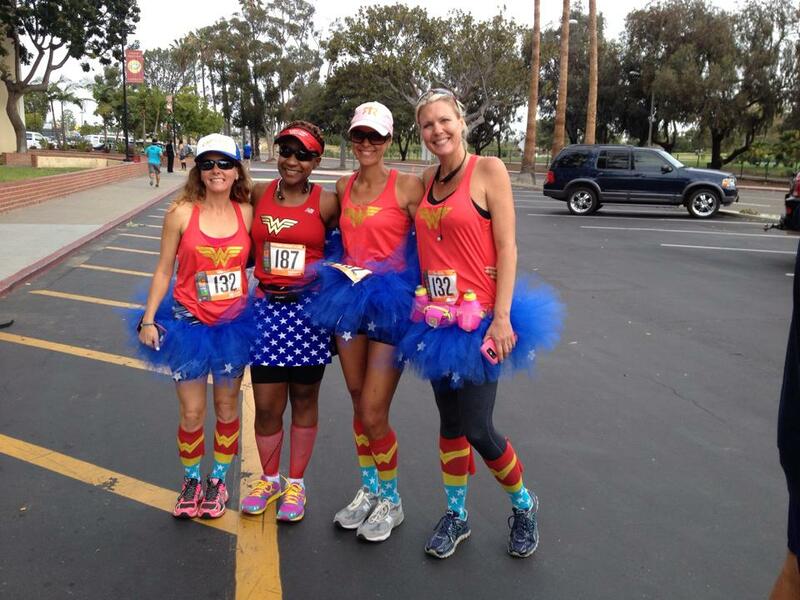 One of the many benefits of running is the people that you meet. 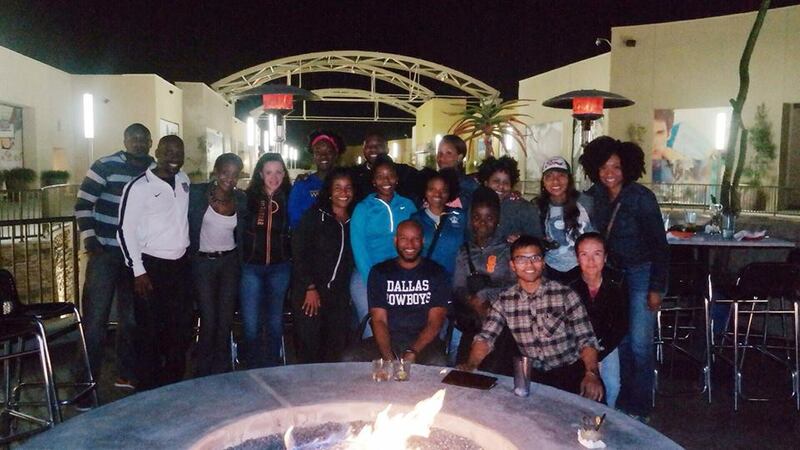 I have running friends from all over the United States, even some in other countries. Bonds that will indeed last a lifetime. We start the race, and my foot was feeling fine. I started slow, because I was running for fun not time. I had to save some for the half marathon the following day. 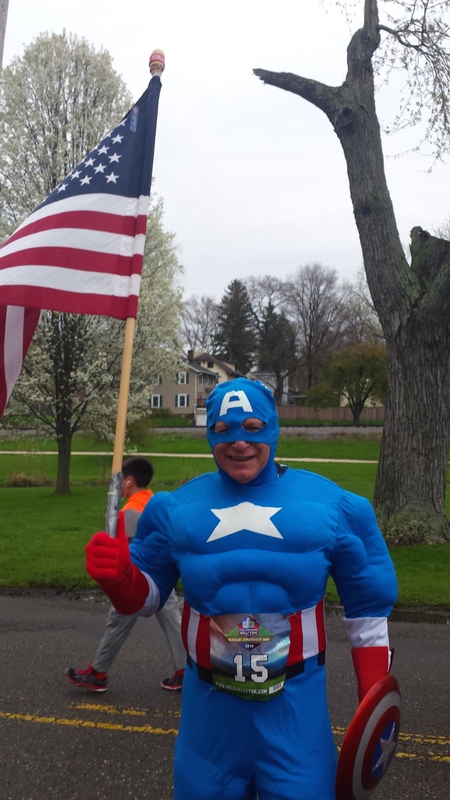 I stop to take pictures with a man dressed as a referee, and Captain America. My foot was hurting a little at the end, but it was worth it. It was time to move to the host hotel. Later that evening NBMA had a meet and greet. 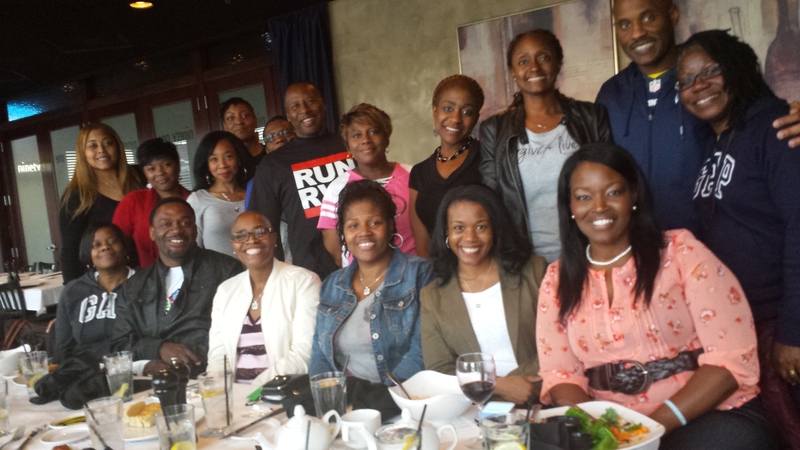 I was blessed to meet some runners from Charlotte, Washington DC, and Maryland. Also adding new people to my running circle. It was time to head over to Half Marathon race start. I met allot of people who had just got in from Kentucky. Some had run a marathon the day prior, some a half marathon. They were in the process of chasing 50 states. 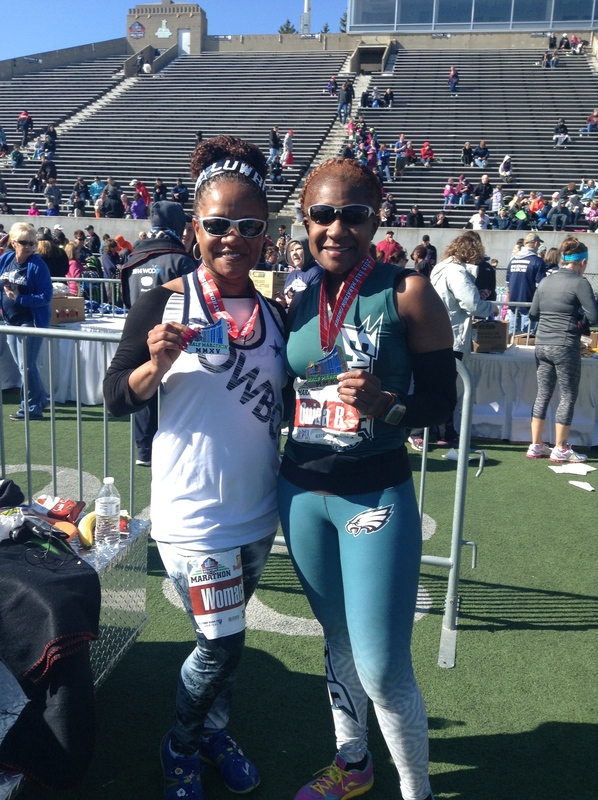 Some half marathoners, and marathoners have the goal to do a half or a whole in all fifty states. Many do back-to-back races. I met a gentleman who was scheduled to run seven half marathon in a week. I had on my #1 football team paraphernalia. I happened to be the only Eagles fan there, but that was ok. The race started my foot was bothering me a little, but I ran and listened to my race playlist. I had just recently downloaded Empire sound track, which was a great move. I thought happy thoughts. I thought about my Dad , and I was in celebration mode. As one of my good friends always says “ Run Happy”, and that is what I did. I was running to the beat. Every mile I cheered. The crowd support for race was ok, not great. After 6 miles my foot was talking to me, but I kept it up. Three songs from the Empire soundtrack gave me great motivation. One being “ Your So Beautiful” the beat alone kept me on pace. I also love hearing I am beautiful, because I am. I am not conceited. I give all glory to God for everything I am, because I used to have low self-esteem. I had to learn to love myself. The second song that helped was “Keep It Moving” because that is what I had to do. I had to keep running with one foot in front of the other. I had to keep going every mile to the finish. Running is like life you have to keep in moving. Keep moving to the finish line. The third song that stood out to me was “Conqueror”. I am a conqueror, and I don’t accept defeat were the words that gave me motivation. I was pumping my fists, moving to the beat having a great time. A few people looked at me like I was crazy, but I did not care. 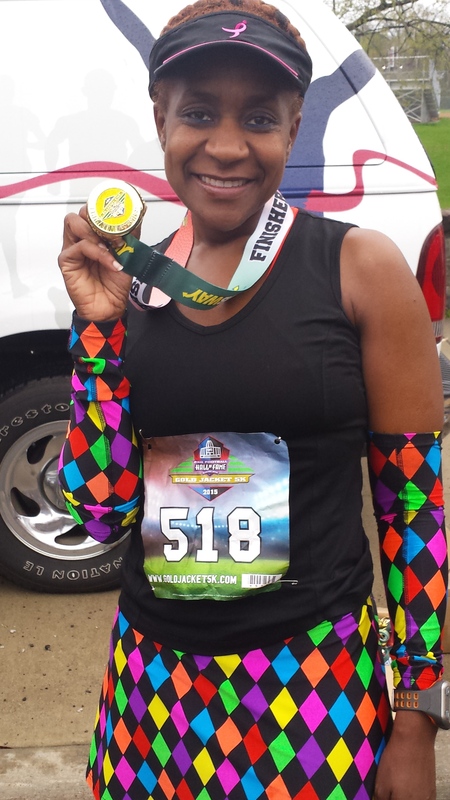 I was running my race, my pace, having a great time. I was nearing the end. I saw the Hall of Fame building. 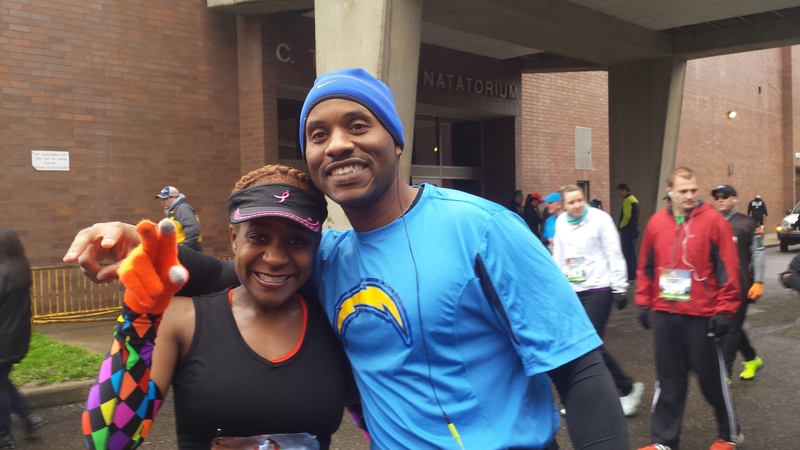 I had to finish strong so I sped up, and tried to encourage others at the end. I was saying to them we are almost done, come on we can do it. The race ended in Fawcett Stadium. This is the stadium where they play Hall of Fame football game each year. As you run in the stadium they announce your name. 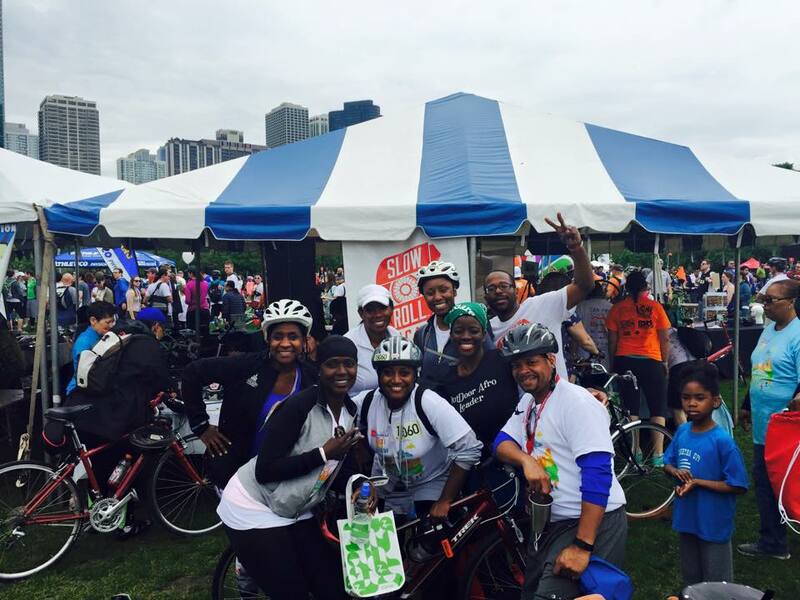 I hear “Ouida Brown from Chicago” and sped up even more until I hit the finish line. I had done it. I made it. My foot held out, it carried me to the end of the race. 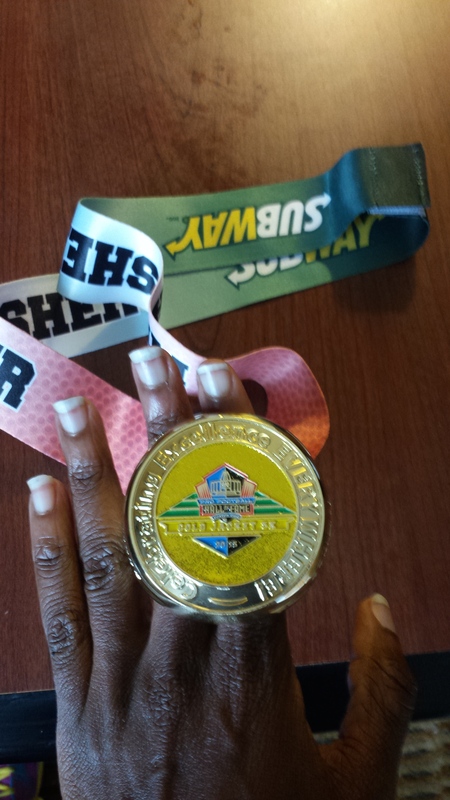 Half of Fame Half Marathon was a great experience. I would recommend it for anyone who loves to run, and anyone who loves football. To top off my weekend I went to the Pro-football Hall of Fame Museum. I speed three hours and would have stayed longer, but they were closing. I took over one hundred pictures, and plan to go back soon. Check out my slide show from the Pro Football Hall of Fame if you are interested. 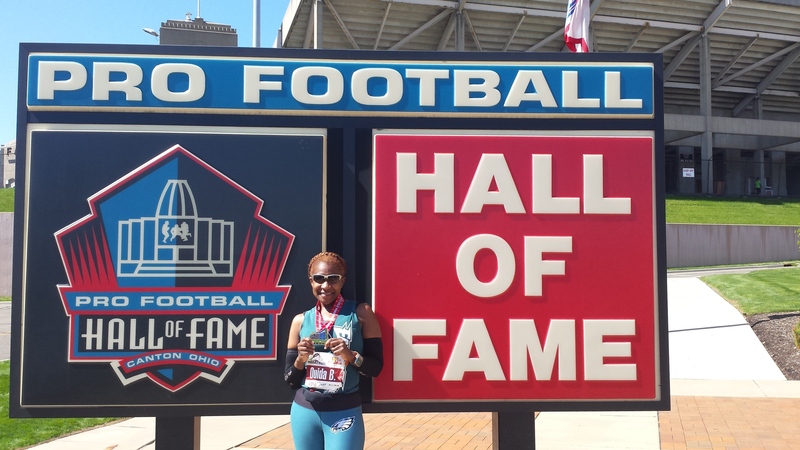 This week’s blog was supposed to be about my recent Pro Football Hall of Fame race weekend. I will share later. My world was rocked last week. A good friend of mine died of breast cancer last week. She loved life, and lived it to the fullest up until her last breath. My heart is heavy over the world’s lost of such a wonderful person. My life was turned upside down when my mother died. I sunk into a deep depression. I found my way back to myself. I learned to live my life, to love my life. Tomorrow is not promised, so live/love enjoy every moment. Still can’t believe she is gone. Her death brought back so many painful memories of my mother’s death, as well. It is so hard to say Goodbye. Or goodbye may not be the proper word. See you later because I know I will see her in heaven one day. I will mourn for a while, and then I will continue to live my life to the fullest. 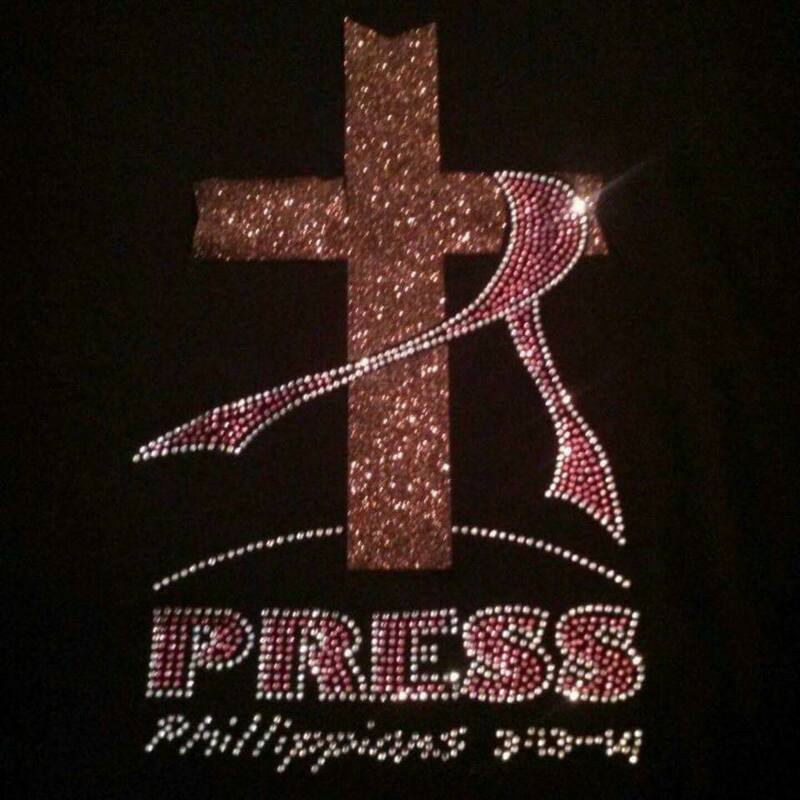 I will continue to PRESS! The fact is that as Americans we are dying because we are overweight, have poor diets, and don’t exercise enough. So if running is something you love to do, do it, get off the couch and run. Please get a physical prior to doing so, if you have not been participating in any type of physical activity. I always tell my friends that if one day I need a knee replacement. I know plenty of orthopedic surgeons who can replace my knees. I would rather have a knee replacement than an amputation due to diabetes, heart bypass due to coronary artery, neurosurgery due to aneurysm because of uncontrolled hypertension. Life is short, then you die. Find what make you happy and literally run with it. Let me leave you with some motivation to hit the pavement. 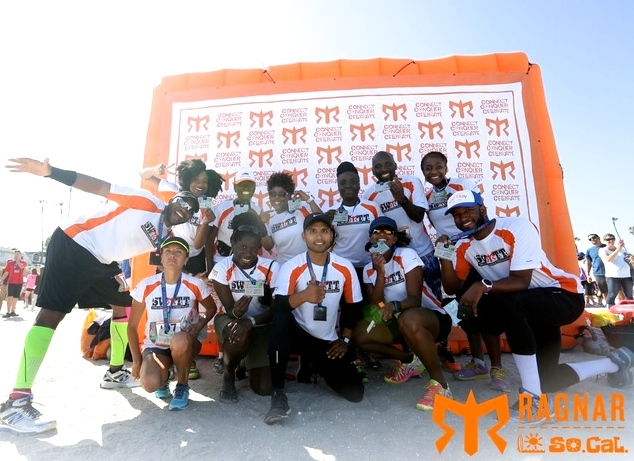 First of all you may ask “What is Ragnar”? Let me begin with this video. 12 people, 2 days, 2 vans add an Ultra, and that equals quite an adventure. Ragnar was just what I needed. It started with a four hour delay at Chicago O’Hare airport. 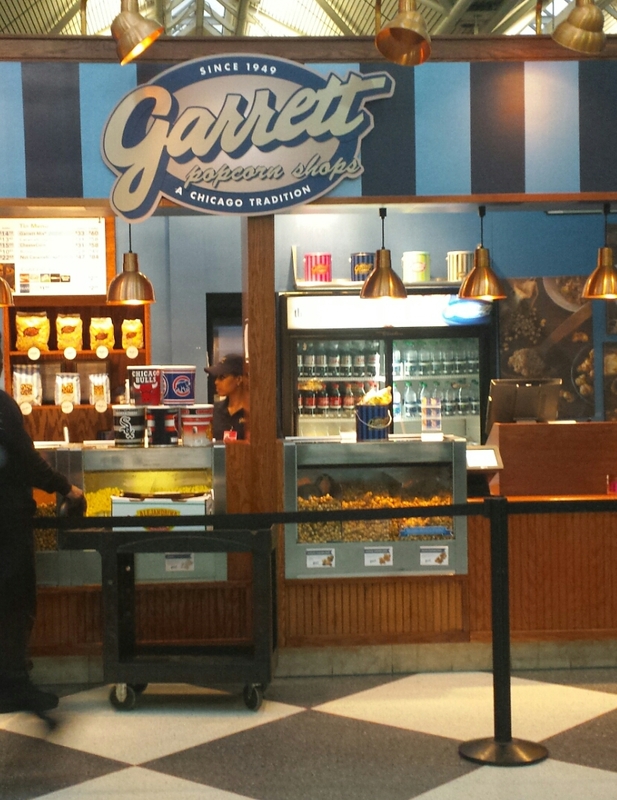 I kept the faith and resisted the temptation of Garrett’s popcorn which was across from my gate. Plane was late, then we had no pilot, then we needed fuel, then we needed another flight attendant. It finally came together and we were off, and headed to San Diego. 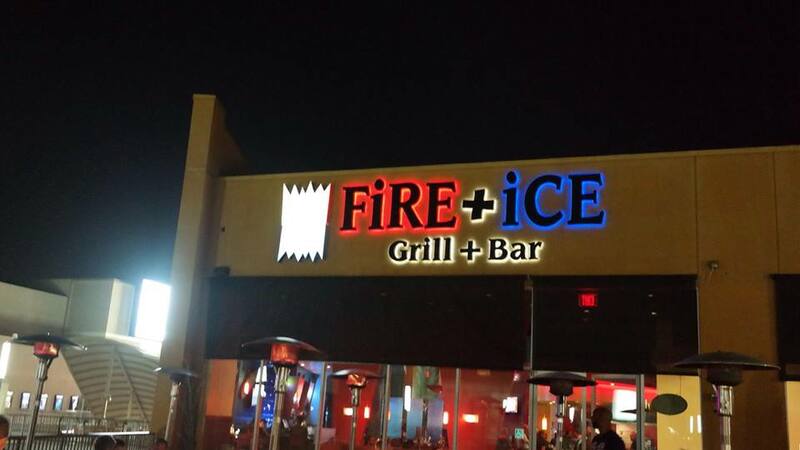 The team festivities started with a group dinner at Fire and Ice. I was beyond happy because they had tofu and salad. I eat mainly a vegan diet so sometimes eating out can be difficult for me. After dinner it was off to bed for everyone. 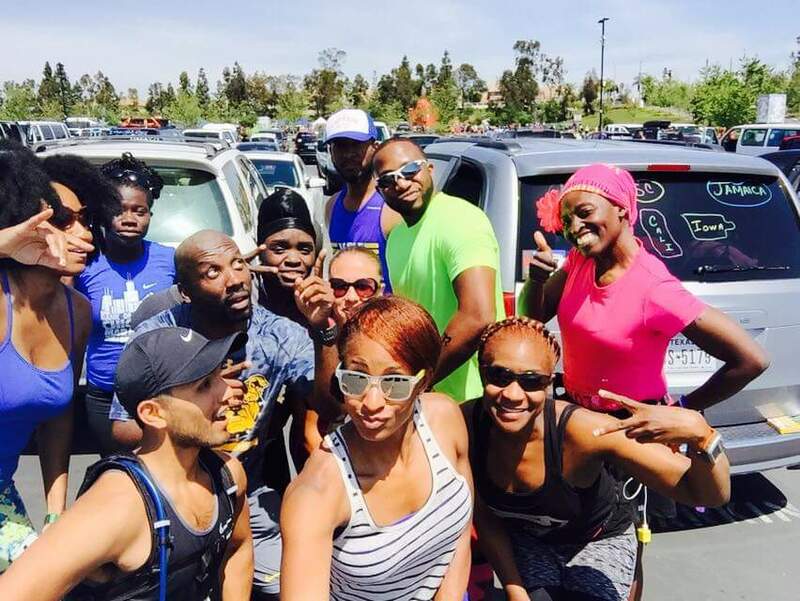 The Ultra team had to start at 5am. We were lucky to sleep a little later. Van 1 started at 8am. We were hype. Van 1 had six people. Our legs ran smoothly no one had any problems. Alicia brought it in for Van 1. She had the hardest leg, and it was hot. That made it even worse. Our wonderful navigator guided Curt to our next major exchange where we would eat, and rest until it was time to run the second round. It was nice to have a fellow vegetarian person in my Van. I was able to find a place, and not eat on my own. After eating, it was time to pull out my sleeping bag to catch a quick nap. A few hours passes and it was time to run again. 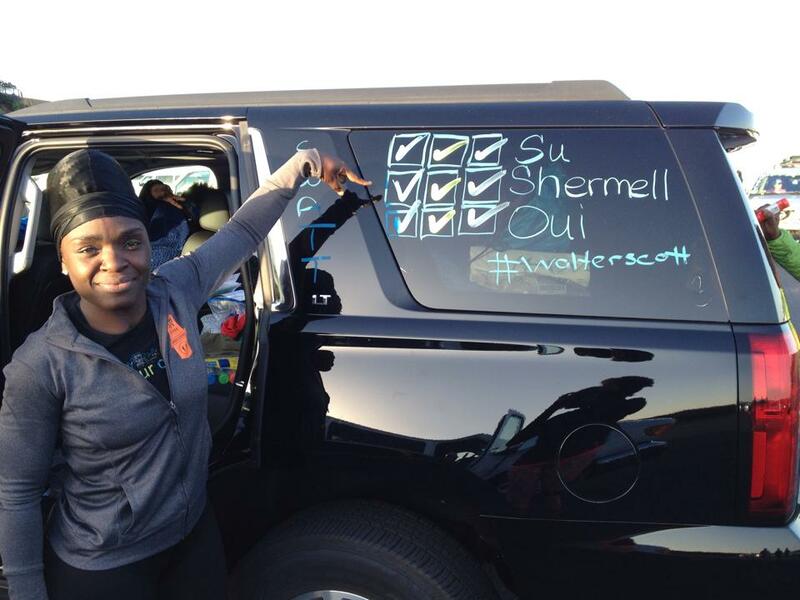 Su would start us off again. It was about 8 pm. 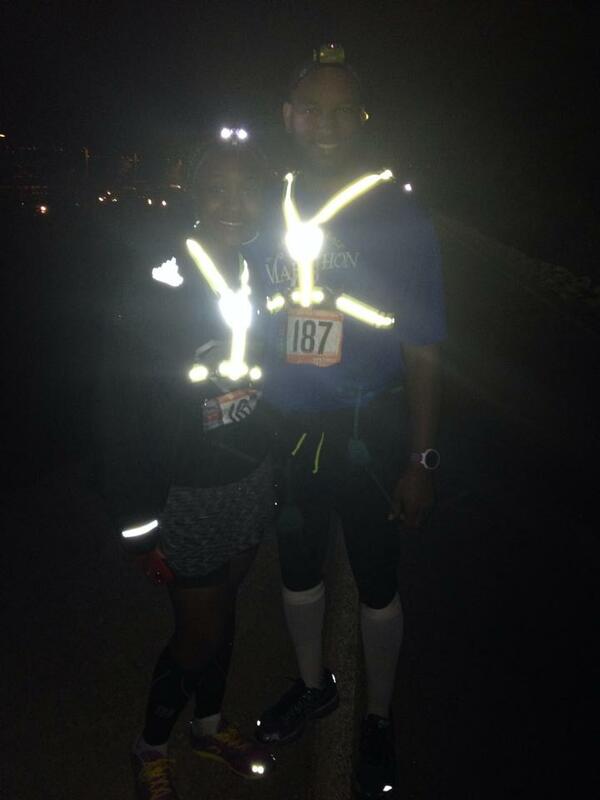 We wound now have to wear night wear- head lights, tail lights and a reflective vests. 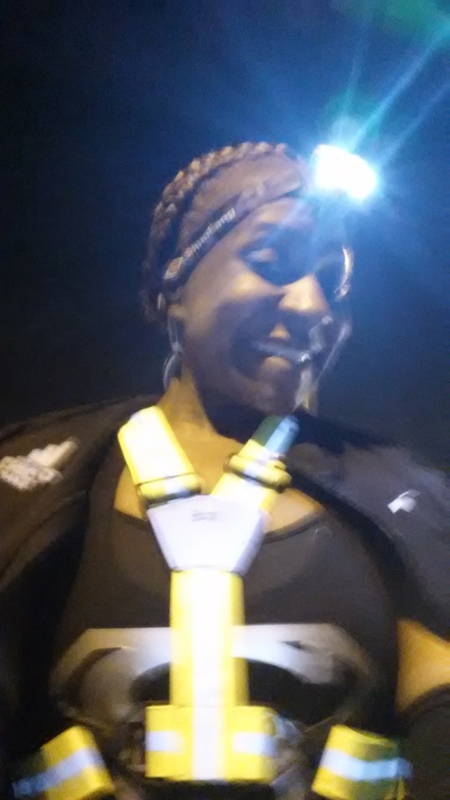 Night running was an experience I missed last year during Ragnar Chicago. All my legs were in the day. This was my best run. I was scared that something in the woods would come out and get me. This actually made me run faster. I also was able to get some quality kills. A kill is when you pass someone. I only got about three last year. I was a able to get five this one leg alone. I was rolling up those hills. Almost four miles later, I would pass it on to Curt. We finished our six legs and met Van 2 at the next major exchange. It was time to sleep; it was about 1am. I got my sleeping bag to sleep. 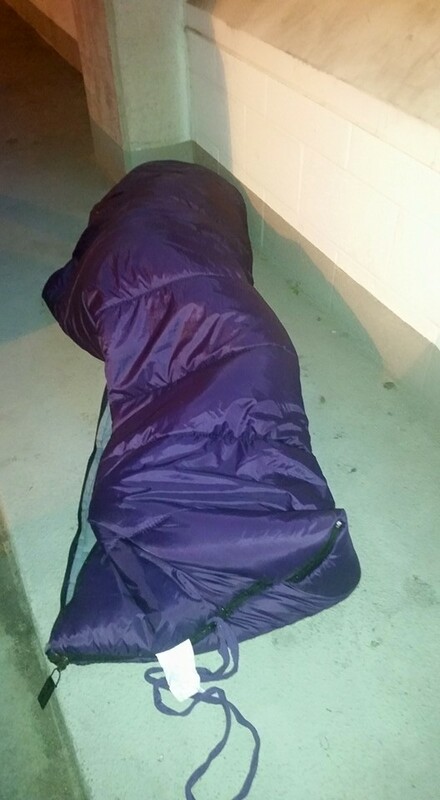 I was knocked out; it is amazing how comfortable a sleeping bag can be when you are worn out. Van 2 was running while we were sleep. About 4.5 hours later it was time to start the third round. It was Su’s turn to start the third and final round. It was 5am the next morning. By the time my leg came up again, the sun was rising. I was so excite. A new day, my last leg, my foot had hung in there. I have a condition call plantar fascitis which is irritation of the fascia ( tissue) on the bottom of my foot. It hurts the most the first thing in the morning. It had been bothering me for sometime. I only had 3.6 miles to go, and I was ready. 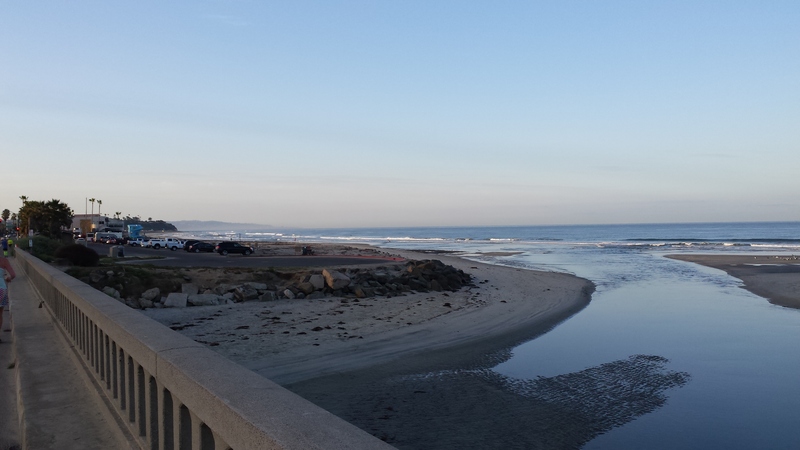 I saw the beautiful coast, the water, and all the runners in the area getting in their Saturday morning runs. I was in heaven. Some people run to eat, run for beer. I run to see beautiful sites, and along the process I meet the coolest people. I was thinking who could as for more. Almost four miles later, I was done with my legs. I passed it on to Curt. Runners 5, and 6 finished their final legs. Van 1 was done. It was time to travel to the last major exchange to meet Van 2. We had a few hours to shower and change and met Van 2 at the end of it all. Van 2 did their last legs. We all ran in together at the finish line. We had done it 12 people, 2 days, 2 vans, 200miles. 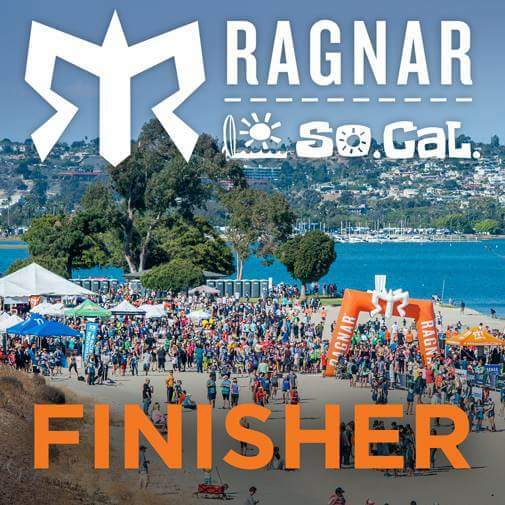 I am so happy I decided to do Ragnar. Running is my life, it gives me joy, it helps free my mind, it helps me stay grounded and realize what is important. It was just want I needed.